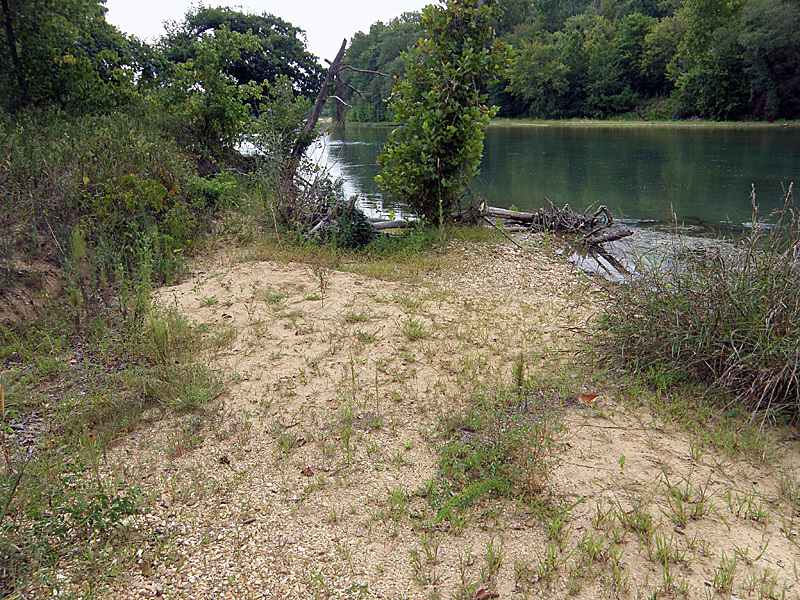 Cataract Landing on the Current River is a little out-of-the-way, fifteen twisty, up-and-down miles south of Van Buren. Once you get there, don’t expect any amenities. A gravel boat ramp and a few parking spaces is all you’ll find. But just upstream of the boat ramp is a lovely sand and gravel bar without much vegetation. If you visit in the summer and look closely, you’ll probably notice lots of tiny figures running willy-nilly all over the sandy area. Look closer still and you’ll find that each of these tiny creatures is actually a fearsome predator (well, they’re fearsome if you happen to be 10mm long.) The official name for these little monsters is Cicindela repanda, but the common name is the Bronzed Tiger Beetle. 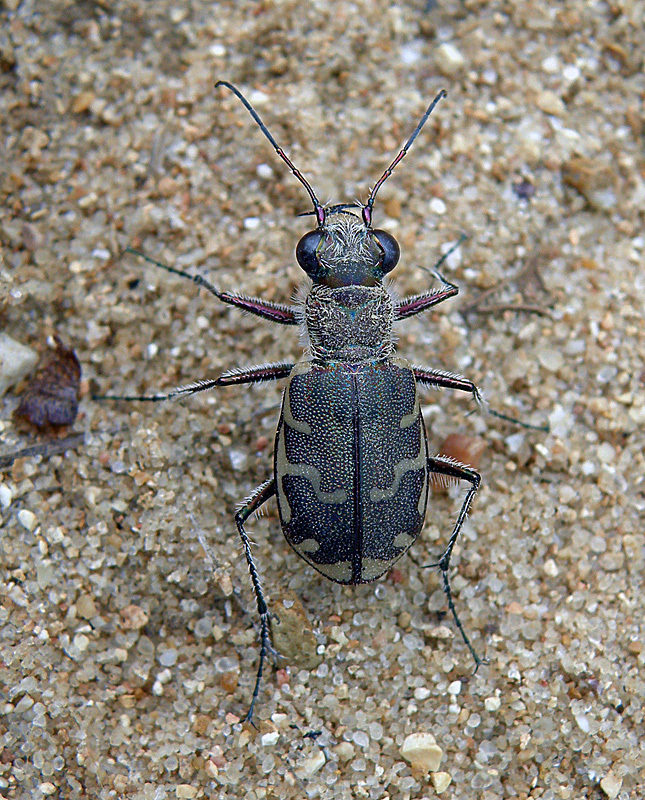 One of the most common tiger beetles in Missouri, C. repanda is easily identified by the “C” shaped marking on the shoulder of the elytra. They’re found in gravel, sand or clay areas that have sparse vegetation, located near a stream or lake. An extremely widespread species, they’re found throughout the continental United States, excluding the Great Basin and Desert Southwest, and much of Canada as well. Small at 10–13 mm, they feed mainly on insects, but anything small enough to be taken is fair game. 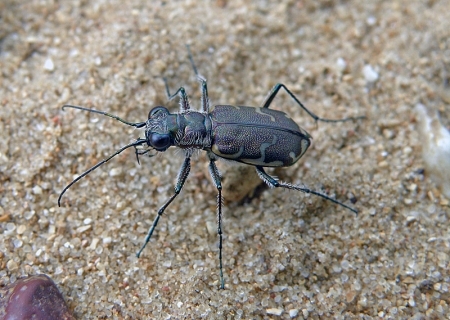 Oddly, C. repanda also occasionally feeds on fruit, the only tiger beetle known to do so. C. repanda is active from January to June and again from August through October. Their life cycle lasts two years with both adults and larvae overwintering. The larvae dig their burrows near water’s edge in the same open areas that adults are found. Burrows that are too dry or flooded are abandoned and a new one constructed. 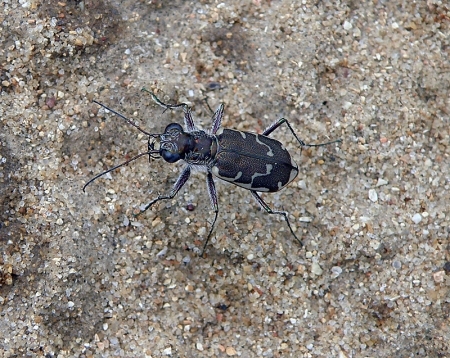 The larvae are commonly parasitized by flies of the genus Anthrax. They’re quick, skittish and will fly a short distance if pressed too closely. Staying focused on an a single individual long enough to get a photograph must be similar to what a lion faces when cutting a zebra or gazelle from a herd. It’s possible, but expect to pull some hair out before it’s done. Oy.